Jump Ultimate Stars (ジャンプアルティメットスターズ Janpu Arutimetto Sutāzu?) is a fighting video game developed by Ganbarion and published by Nintendo for the Nintendo DS. 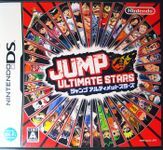 It is the sequel to Jump Super Stars, also released for the DS. The game was released in Japan on November 23, 2006. The game premise is similar to Nintendo's multi-character platform beat'em-up series, Super Smash Bros., except that it uses characters from Weekly Shonen Jump rather than Nintendo. There are no plans for the game to be released outside of Japan, largely due to international licensing issues for the plethora of series represented. The game keeps many features from its predecessor, and adds many more. The game boasts 305 characters (56 of which are fully playable) from 41 different Shōnen manga series compared to 160 characters (34 fully playable) from 27 different manga in the original. However, the characters from Hikaru no Go and Mr. Fullswing do not return in this sequel (Steel Ball Run is unaccounted for because it has been revised into a story arc within JoJo's Bizarre Adventure between the releases of both games)." Source: Wikipedia, "Jump_Ultimate_Stars," available under the CC-BY-SA License.